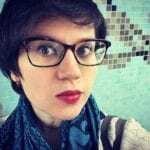 Yelizaveta (Liza) Shapiro is a doctoral candidate in Comparative Literature at the CUNY Graduate Center. Her dissertation, ‘Bodies Wiley and Bodies Vile: The Promise of Androgynous Poetics and the Threat of Abject Materiality in the Works of Virginia Woolf and Zinaida Gippius’ explores the interplay of androgyny, disgust, and new forms of female embodiment in British and Russian modernism. Liza is an English instructor at Hunter College where she has also taught Russian language and literature. She lives in Queens with her two cats and partner and is an avid cheese eater, poetry reader, and American Horror Story binger.